Nasrin Qader is Associate professor of French and Comparative Literary Studies, holding a PhD from the University of Wisconsin-Madison. Trained as a comparatist, Qader consistently brings together Francophone African literature, Arabic literature of the Maghreb, Islamic thought and mysticism, and contemporary literary and visual theory. In 2009-2010, she was awarded a New Directions Fellowship by Andrew W. Mellon Foundation, which allowed her to study the religious and literary traditions of India. Nasrin Qader has written on the work of Mohammad Barradah, Abdelkébir Khatibi, Abdelfattah Kilito and Tahar ben Jelloun of Morocco; on Yasmina Khadra of Algeria; on Moussa Ouled Ebnou of Mauritania; and on Boubacar Boris Diop of Senegal. Her first book, Narratives of Catastrophe: Boris Diop, ben Jelloun, Khatibi (Fordham University Press, 2009) studies the relationship between récit (narration, story) and catastrophe. Her second book tentatively titled Twists of Light and Shadow: on Visuality and Writing studies the question of visuality in film and literary writings from North and West Africa. Qader also works on contemporary Persian literature from Afghanistan. She has published on the photographic dimensions of the Afghan writer and filmmaker, Atiq Rahimi’s novella Khakestar o Khak (1998) (Earth and Ashes ) in Modern Philology and is currently working on selected short stories by Asef Soltanzadeh. Qader has presented her work in venues within the US and internationally. She has been invited to give a number of lectures at Ecole des Hautes Etudes (EHESS), and Ecole Normale Supérieure-rue d’Ulm, in Paris. Currently, she serves on the editorial board of the African Arts and Humanities Series of Michigan State University Press. Qader’s teaching interests include the detective novel; contemporary literary writing in French, Arabic, and Persian; contemporary literary and visual theory and in particular the works of Maurice Blanchot, Jean-Luc Nancy, Jacques Derrida, and Abdelkebir Khatibi. In the summer of 2012, she participated in the Institute for World Literature organized by Harvard University and Bilgi University, Istanbul, exploring the theoretical and methodological underpinnings of this method of literary inquiry. 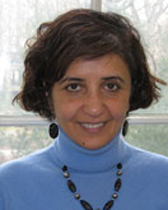 Nasrin Qader is an active member of the core faculty of the Program in Comparative Literary Studies and the Program of African Studies. She is also a Chevalier de l’Ordre des Palmes Académiques.